I've said it before, but I'm going to say it again: One of the best things about blogging is all the wonderful events you get to participate in. It's also one of the main reasons I started my own blog. The excitement of the challenge, finding a recipe, and seeing what everybody else did is one of my favourite things. I'm a regular on Is My blog Burning, checking out any new interesting events. One of the wonderful blogs I came across is Feasting on Art, hosted by the lovely Megan. On April 3rd her blog will be 1 year old (Congratulations Megan! ), and to celebrate she's holding a recipe competition. 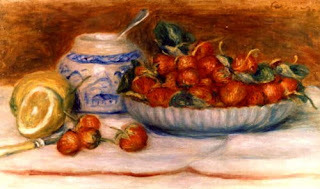 She challenged readers to come up with an original recipe featuring the ingredients depicted in the painting "Strawberries", by Renoir. I've been to the Musee de l'Orangerie a few years back when I visited Paris with my brother. I love the Impressionists, especially the Waterlilly series by Monet. Most of this collection is at the Musee de l'Orangerie, and I spent a lovely morning looking a the paintings, and then browsing the gift shop. Now, I'm a firm believer that you can tell a good museum by two things: the gift shop and the coffee gallery. I learned this from my brother. I used to feel compelled to look at as much as I could in a museum, until I went on holiday with him. We were visiting the Musee d'Orsay, also in Paris. After I'd seen the Impressionists, and ready to start looking through the rest, my brother informed me that he'll wait for me in the coffee shop. I was aghast! What about all the rest? What about Picasso? And Corinth? And Hals? Baby Brother calmly informed me that he doesn't actually like Picasso and Corinths and Hals, and he would much rather be having a good cup of coffee. I had to agree with him that I didn't really like Picasso and Corinth and Hals either, and we spent the rest of the morning having coffee and croissants and indulging in a spot of people watching. Which is one of the funnest things to do in Paris, let's be honest. A few years later I was in New York, and obviously the Met is a must-do. How beautiful is that museum! There was so much to see, I couldn't get through half of it. I saw their Impressionists (of course), and then went to see their ancient history collection, another favourite of mine. It was while doing this that I stumbled upon one of the many gift shops in the museum. I won't go on and on about this, because I tell you, I will if given half the chance. Let's just say that all the beautiful books and prints and gifts impressed me almost as much as the paintings and artifacts. At least half of my budget was blown there. So you see that this contest is combining two of my favourite things: cooking and art. For my entry I made salmon with a feta and strawberry crust. I find cooked salmon quite rich, and think that it needs something fresh to cut the richness a bit. Strawberries fit the bill nicely. Add some feta and a few herbs, with some lemon juice for a bit of zing, and this recipe is the perfect one to celebrate the last strawberries of the season with. I also want to thank Megan for allowing me to post this late entry. For some reason I couldn't find any strawberries on my holiday in South Africa, and when I saw them on the shelf this morning I had to have them. Here's to you, Megan! May we enjoy your blog for many more years to come. Preheat your oven to 200°C . Briefly wash the strawberries, then hull and chop them. If you don't have marinated feta, mix your chopped feta with some of your favourite chopped herbs (I'm thinking thyme will go nicely) and some olive oil to moisten. Otherwise, drain most of the olive oil from your marinated feta and use this. Mix the strawberries and feta together, with half of the lemon juice. Add some salt and cracked black pepper to taste. Place the salmon fillets on a baking sheet lined with baking paper, skin side down. Press the crust mixture on top. Drizzle with a little bit of olive oil. Bake for 10-15 minutes, depending on the thickness of the fish, until it flakes easily. What a wonderful idea - that is art and food, very creative. The wine is great, I didn't enjoy it the first day though, I had a sinus infection, and it was a huge bottle. THe 2nd day tasted better. Baby Brother strikes again, and still no photo! Pretty pleeeeease? I'm with you! Blog events are the best and spur so much creativity. I love this dish. So unique!